Kelsea insisted that I take this picture of these two seashells snuggling, and I’m glad she did. This pair was found out on a great wide flat beach at the tip of Cape Lookout National Seashore. We accessed the point by ferry and by “Mule Train” (the latter of which I was disappointed to discover was just a seat in the back of a pickup truck, and not an actual mule train), about a 10 minute ride from where the ferry dropped us off. On one side of the point was the sea and on the other side was the sound. Contrary to most beaches I’ve combed, our driver said the bulk of shells, such as whelks and conchs, could be found on the sound side. 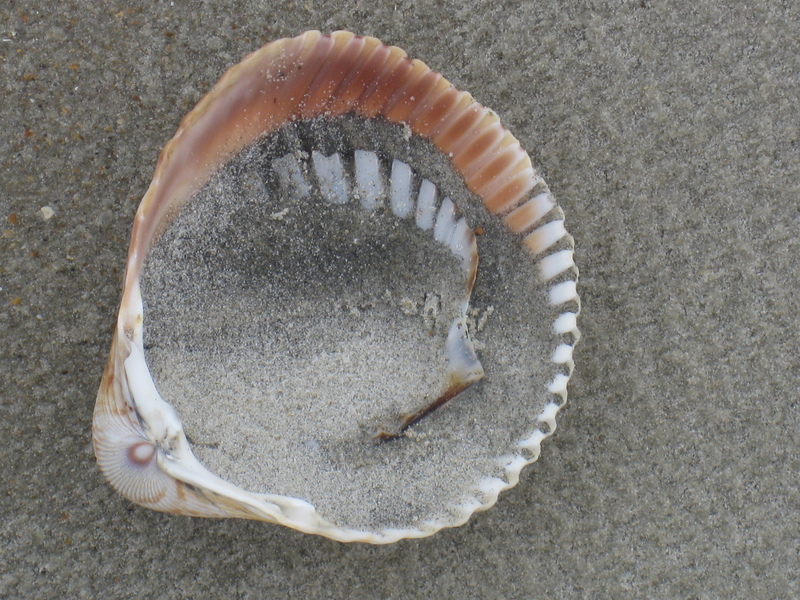 We figured since she had been telling people that all day, that the sound side was fairly well picked over, so we crossed the vast sandy desert to the sea side and discovered treasures such as this one, as well as the sand dollars featured in a post last week. I love this image! There’s art in this family! Baby shell and Mama shell!